Few Guitarists are unaware of Frank Zappa, who for the past 16 years has produced dozens of albums featuring sharp satire, full-scale orchestrations, and powerful guitar solos. Last profiled as the cover subject of the Jan. '77 issue of Guitar Player, Zappa has since released several albums, including the three-record Shut Up 'N Play Yer Guitar series for his Barking-Pumpkin label: Shut Up 'N Play Yer Guitar [BPR 1111], Shut Up 'N Play Yer Guitar Some More [BPR 1112], and Return Of The Son Of Shut Up 'N Play yer Guitar [BPR 1113]. Although all of Frank's albums have a sizeable quantity of guitar work, this trio of LPs contains pieces that are specifically guitar-oriented. This Month, we welcome Frank as a regular columnist, presenting the first installment of a series in which he addresses specific questions regarding his creation of the Shut Up 'N Play Yer Guitar series. In this and subsequent columns, he will also discuss his views on music and solo techniques beyond the range of these three LPs. Transcriptions of Zappa's pieces are provided by Steve Vai, who has been one of Frank's guitarists for the past few years. What made you decide to do the Shut Up 'N Play Yer Guitar series? There were a lot of requests from a certain group of fans that we have for an album that just had a lot of guitar solos on it. I mean, it's not that they delivered a specific order as to how it was going to be put together, but there was a demand for albums with a lot of guitar playing. Although I play maybe anywhere from five to eight extended solos during a concert, the basic style of the show that we take on the road is not guitar-spectacular oriented. There is SOME guitar playing, and some people really like that stuff. And so to accomodate them, I put it together. Why did you choose material recorded over a four-year period, rather than taping new songs especially for this project? Well, there's a good reason for that. First of all, I find it very difficult to play in the studio; I don't think that I've ever played a good solo of any description in the recording studio. I just don't have the feeling for it. And up until the time that I got my own studio, I was working in commercial ones where you have to pay anywhere from a hundred to two hundred dollars an hour for the time. There you don't have the luxury of sitting and perfecting what it is that you're going to play, whereas if you have a collection of tapes made over the period of a few years -- which I do -- you can go through that stuff and find musical examples that achieve some aesthetic goal that you're interested in achieving. Then you collect those together and make the best possible performance out of that. How did you determine which songs you wanted? Was there a scheme? I tried to get different examples of different types of things that I play. I have one basic style, but inside of that style there are different things that I play. I wanted to have various examples of those things. And most of the selections were made on my own gut reaction to hearing the tapes and saying, "I like this solo" or "I don't like that one" -- just trying to find things that would fit together. Your music prominently features unusual rhythms and syncopations. A good example is "Five Five Five" (Shut Up 'N Play Yer Guitar). What kind of metric scheme was used? It's in 5/8, 5/8, 5/4. You count it like this: One two one two three, one two one two three, one-and two-and three-and four-and five-and. 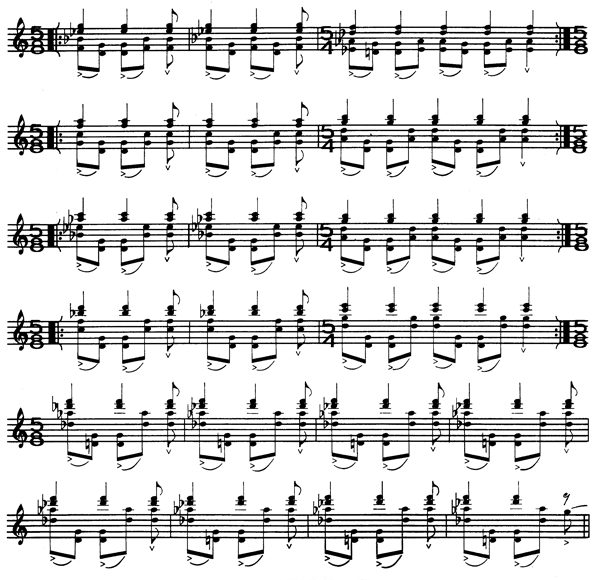 In a piece such as "Five Five Five", where you're in a meter that would generally be considered odd for mainstream rock or jazz, how would someone approach that without feeling as if they had two left feet? It's a very guitar-oriented piece because of the way it uses the open string. So it's kind of an easy thing to pick up on the guitar, in spite of the odd rhythm. As long as the numbers involved tend to frighten you, though, then the odd rhythms are not your meat. Don't worry about the numbers -- you just have to worry about what the FEEL is. When I wrote that particular song, I never even stopped to figure out what the time signature was. I don't worry about that if I'm playing it on the guitar. If I'm writing it for an orchestra, then I do. But I don't calculate how things that I make up on guitar are going to look on paper or how it's ultimately going to be. I just play it, and then figure out what it is later, after I've recorded it. In other words, my theory is that written music in no way assures the pedigree of the musical quality of what's being played. Just because it's on paper doesn't make it any better or any worse than any other kind of music. Music on paper is just a convenient way of showing musical ideas from one person to another without having to hum it to him. And when you get things that are complicated, it's really time-consuming to hum them. So you view writing as a shortcut. It's a shortcut; it's a storage method. And in the case of the transcriptions that are coming from the guitar albums, they're no longer shortcuts because they don't need to shortcut it anymore -- they're all done. [Ed. Note: Transcriptions from the Shut Up 'N Play Yer Guitar series are scheduled to be available in the next few months.] But it's the way to show people who are interested in that kind of rhythm what it looks like on paper and how it works. Also, in a couple of examples it gives you a kind of positive proof that ESP does exist: The guitar parts and the drum parts for some of the things are transcribed and notated together on two staves, and you can see that the drummer -- in this case Vinnie Colaiuta -- and myself were playing exactly the same thing in a number of places where it would have been impossible to guess what was going on. It's the frequent little turns that are exactly ON, and then coming out on the downbeat in the next bar, and over to the next bar after that. On the inner sleeve of your Shut Up albums is music from "The Black Page." There are figures such as a triplet with groupings of three, five, and seven contained within. How do you count such an intricate part? Well, unless you're really skilled at sight-reading that type of material, you have to start by reading it slowly. So I think you're referring to bar 15 of "The Black Page". And that's a tricky bar to play. But it CAN be played and it has been played over and over again by a lot of different musicians in and out of the band. And it's a good place to start if you want to come into a direct confrontation with the type of rhythm that I use all the time. Any piece of time can be subdivided any old way you like. And that's what happens when people talk, because people don't talk in 4/4 or 3/4 or 2/4 -- they talk all over the place. And if the rhythm of what you play follows along with the natural scan of human speech, it'sa going to have a different feel to it. And in a way, it sounds weir; in another way, it sounds totally natural. It just depends on what you expect to hear from a piece of music. So, to count that particular bar, you divide the bar into a half-note triplet. That's the big bracket. And inside each of the half-note triplet beats, there are further subdivisions. That's all. For someone who has spent a great deal learning mostly from songs with 4/4 rock beats by guitar heroes such as Van Halen, et al, what would be a good way to ease into more complex rhythmic usage? There's no reason why someone shouldn't break out of the Van Halen mode. If you keep playing that way, you're always going to be assured of work. I don't recommend that anybody copy what I do or follow in that musical path, because what it's going to lead to is being outside of the framework where you can earn a living at what you do. You know, the more you play in 4/4, the better off you're going to be. That's the bottom line! Most of the people who read Guitar Player, I think, are interested in improving their careers. But how can the average guitarist go about deciphering odd meters? Well, let me put it this way: If you're going to go out of the norm, go all the way. Don't go out just a little bit. If you're scared to go out there, stay in the norm; just learn to play really well in 4/4. But if you want to go beyond that, you've just got to set your mind to going in a totally different direction. If you want to count odd meters, they're all broken down into groups of twos and threes. So, as you take the quarter notes of a half-note triplet, and divide them into groups of three, five, and seven, for instance, you produce tinier subdivisions. It's not just tinier subdivisions. What amounts to is ritards [ritardandos, or periods of slowing down] and accelerandos [speeding up] inside of a bar, mathematically worked out so that instead of bomp, bomp, bomp bomp -- four beats in a bar -- you get other kinds of action, where the time inside of the bar goes faster, goes slower, and goes faster again. But it comes out on the downbeat of the next bar. So if you're tapping your foot to it, you can still tap your foot to it: You're going to come out on the downbeat of the next bar. Did you write out parts for the other players in advance? Well, most of the songs on the guitar albums are improvisations, with the exception of "The Deathless Horsie," "Treacherous Cretins," and "Five Five Five." Those were heads that were rehearsed, but the parts were never written out -- they were just parts that you hum to them: "And it goes like this." That's the way they were learned, and the rest of the stuff was all just solos. Did you transcribe the pieces yourself? No. I couldn't There's no way. The only person I know who can do this is Steve Vai. He transcribes all that stuff, and it's amazingly accurate. In fact, he recently transcribed a vocal piece that I did, and then learned it on the guitar. The difficult part of the vocal piece is that there is no steady rhythm track underneath it. That makes it even rougher. After he transcribed it, he came in and played the guitar along with what I sang, so it sounds kind of like George-Benson-from-Venus-type thing. He's done it with this piece and another called "The Jazz Discharge Party Hats." So he knows what he's doing when he writes the stuff down. And I've seen him get into violent arguments with people who say, "This can't be right, what you've done here." And he pretty much stands behind every note that he's done. The things are constantly being checked and proofread. The best way to proofread them, of course, is to learn to play them all over again on another instrument, and then play along with the tape to see whether it's totally correct. I would say that most of Steve's transcriptions are ninety-five percent correct. This page was last modified on 7 October 2013, at 03:49.